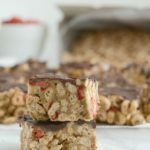 These lightly-sweetened Strawberry Cereal Bars are loaded with whole grains and make an easy snack or breakfast for kids and grown-ups. 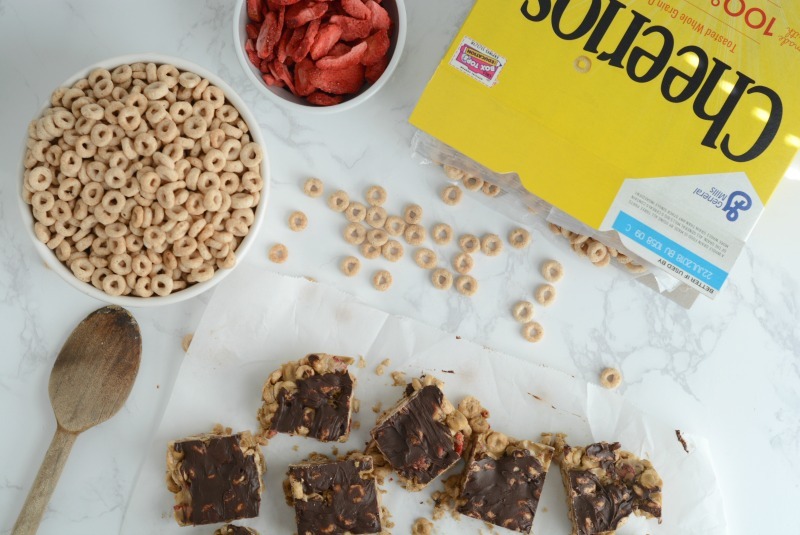 Thank you to General Mills Big G Cereals for sponsoring this post as a part of the launch of the #ButFirstWholeGrain Challenge! I don’t know about your family, but our eating habits—much like our schedules—loosen up considerably during the summer. There’s more grazing throughout the day, more trips to the ice cream shop after dinner, and more late night snacking in front of movies on Netflix. But there’s something about back-to-school season that feels like a new beginning. Time to get back on track. 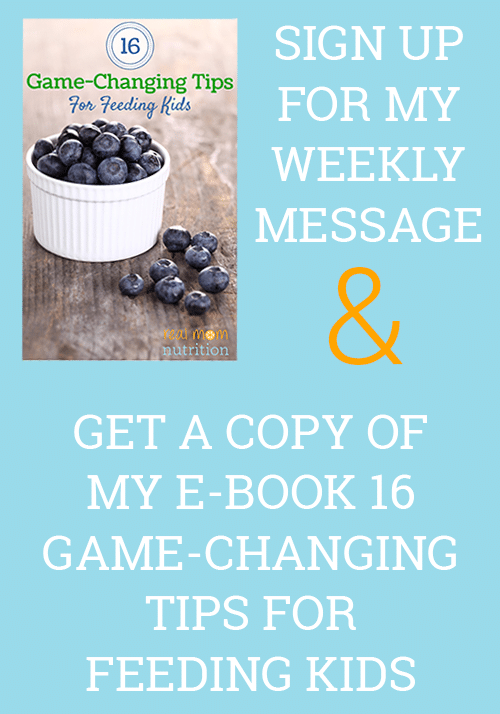 Time to hit the reset button on healthier eating habits. Having a quick and healthy snack to grab in the fridge has become an absolute priority for me. When I have it, I can quickly fill my hunger and get on with things. When I don’t, I aimlessly nibble and never quite feel satisfied. Bonus points if that snack is something the kids like, too. These Whole Grain Strawberry Cereal Bars fit the bill perfectly, especially since September is back-to-school season and National Whole Grains Month. I’m also including an option for a nut- and peanut-free version in case there are allergies in your family or your child’s cafeteria has a no-nuts policies (always check labels to be sure all of your ingredient are nut- and peanut-free). The star of these bars: Cheerios, which I’ve long counted as one of my favorite boxed cereals because it’s so low in sugar (just one gram per serving) and rich in whole grain oats, the kind that haven’t been stripped of their outer coating and boast way more nutrition than the enriched variety. Whole grains also provide energy, minerals, B vitamins, and fiber. It’s recommended that at least half of the grains we eat every day are whole grains. Since our family gets so many enriched grains when we’re out and about—like white pasta at restaurants and desserts at parties—I try to stock as many whole grains at home as possible. That means whole grain crackers, pasta, bread, and cereal are our mainstays. Adults should get at least 48 grams of whole grains per day, and one cup of Cheerios has 14 grams (all Big G cereals, which have whole grain as the first ingredient, have at least eight). Each of these bars has 3 grams. 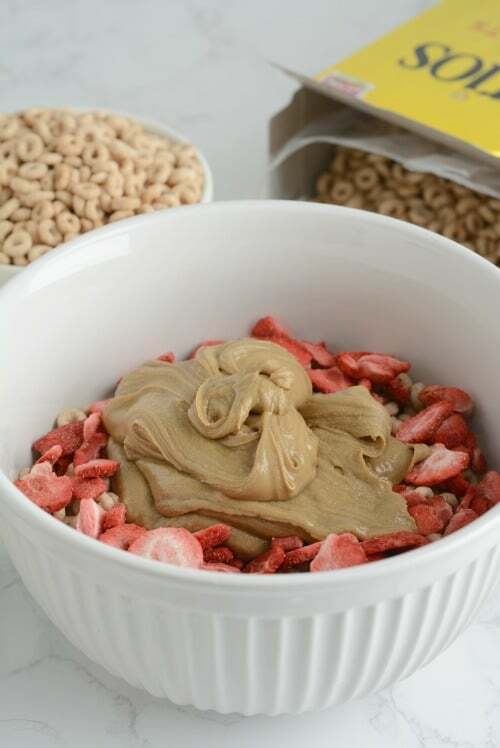 Toss whole grain cereal into a smoothie for thickness and fiber (here’s a recipe for a Chocolate Peanut Butter Cereal Smoothie Bowl that features Cheerios). Make your own homemade trail mix using a whole grain cereal like Cheerios, plus dried fruit, nuts, and seeds. If your kids don’t like whole wheat pasta, mix half white and half wheat and call it “Zebra Pasta”. 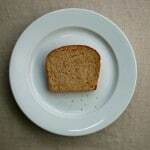 Make a sandwich with half whole wheat pasta, half white. Cut it into squares and invert every other square to make a checkerboard sandwich (here’s how). Brown rice syrup is stickier than honey and holds bars together a bit better. In my local grocery store, it’s located near the maple syrup. If you can’t find it or don’t want to use it, you can use honey. Look for sunflower seed butter in the natural foods section of your store. It’s thicker than peanut butter and won’t thin out as much when heated. My kids liked the taste of both versions! 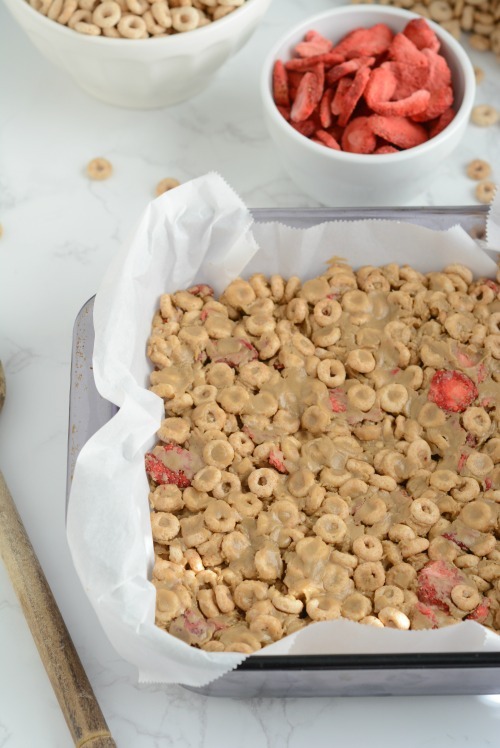 Stir together Cheerios and strawberries in a mixing bowl and set aside. Combine peanut butter and brown rice syrup in a small saucepan and heat on low until the mixture is warm and combined, then pour over Cheerios mixture and stir gently and thoroughly until fully combined. Make sure all cereal and strawberry pieces are coated. Using your hands or the back of a spoon, press mixture into the prepared pan and pat down evenly. Do this firmly so you don't get air pockets in the bars, which will make them crumbly. For optional chocolate topping: Heat chocolate chips in the microwave for 1-2 minutes, or just until melted (stirring every 30 seconds). Spread chocolate over top of bars. It will be a very thin layer; if you want a thicker layer, use 1/2 cup chips. Freeze for 1 hour, then cut into bars. Store bars in an airtight container in the refrigerator. How many ounces in 1 cup of freeze dried strawberries? Where do you get the best deal? They can be pricey. I’m not sure about the ounces, I’ve only used a measuring cup to portion them out. I’ve bought freeze-dried fruit at ALDI and Target. We get them from Trader Joe’s, if you have them near you. 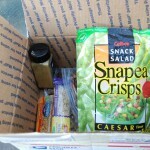 They also have freeze-dried bananas, raspberries, blueberries, etc. They are still expensive, but not as much as other places. Do you think these will freeze well? 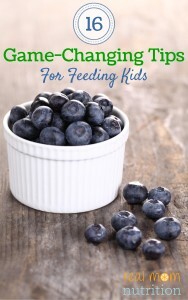 I love making big batches to help with lunch and snack packing during the hectic school days. Also, what size pan did you use? It seems like it isn’t enough for a 9×13″ pan. Thanks! Hi Jill! Yes they freeze very well. I specify a square baking pan. Mine is 9×9. 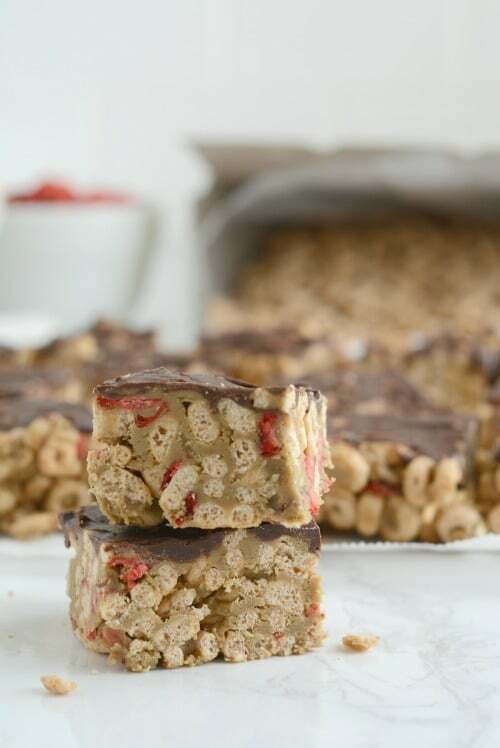 Who doesn’t love a good cereal bar?! They are pretty irresistible, and I love the strawberry addition! 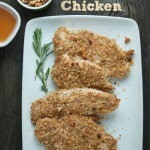 Thank you for another yummy recipe suggestion! I made these yesterday with brown rice syrup and natural pb, and unfortunately, they fell apart. The family loved the taste, but it became more of a trail mix (underneath the yummy dark choc topping!). Any suggestions? Can’t wait to try this recipe! 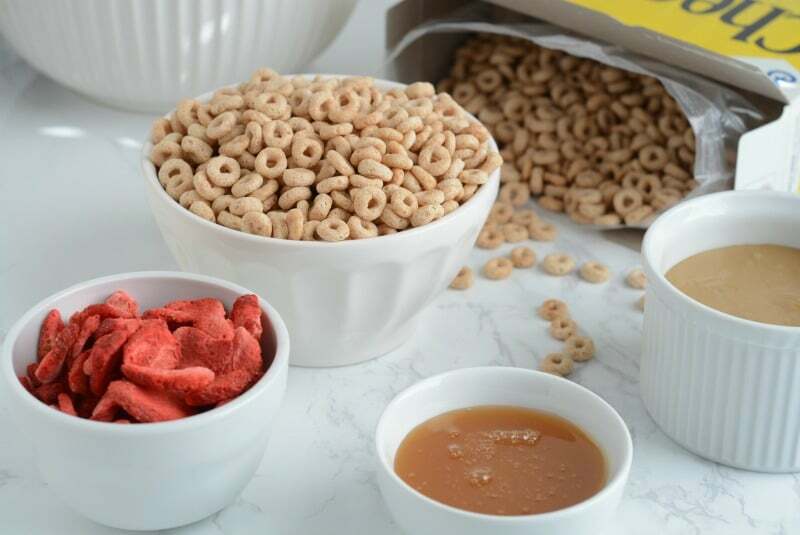 We almost always have Cheerios on hand… as well as a dried fruit. Oh and chocolate. Chocolate chocolate and more chocolate! I made these today with peanut butter and honey. They crumbled a little but no big deal. They are delicious. I had a thought to try next time to make clean up easier. Measure the peanut butter and honey in a glass measuring cup and microwave to heat. After the bars are assembled I was thinking to use the same measuring cup, unrinced to melt the chocolate chips for the top. Do you think this would work? I couldn’t get the stars to work but was going to give it five. I’m glad they worked out for you and that you like them. I love your idea of using the same measuring cup to melt the chocolate. I’m all about using fewer dishes and being more efficient in the kitchen when possible! I see that you say each bar contains 3 grams of whole grains, but how many bars does the recipe make? I want to get the portion size right. Looking at the first picture, I’m thinking it might be 16 bars.